Warming at the poles has been much greater than warming in other parts of the globe, a phenomenon due largely to positive feedback mechanisms. The cryosphere is especially sensitive to warming tem--perature because of the water--ice transition. If the temperature in a tropical forest increases by a few degrees, the forest only becomes warmer. But where water is near its freezing point, a small temperature increase converts solid ice into liquid water. This, in turn, drastically reduces albedo, which further increases warming. Ice does not accu--mulate as easily on open water as it does on or near other ice. 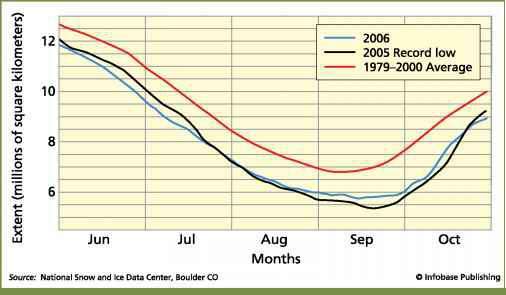 Each winter there is less ice, and the ice that forms is thinner, which makes increased melting likely when summer arrives. Arctic summertime sea ice extent in 2005 and 2006 compared with the average from 1979 to 2000. The past several years have seen a large decrease in sea ice. the past few years. Scientists report that their climate models cannot explain the great loss of sea ice without factoring in human-induced greenhouse gas emissions. 650 feet (200 m) thick. Its collapse followed that of the Larsen A in 1995. Glaciers and ice sheets have been in retreat at least since 1961. Beginning in 2000, the melting rate was 1.6 times more than the average rate of the 1990s, and three times the rate of the 1980s. Glaciers in the low latitudes are retreating most rapidly. 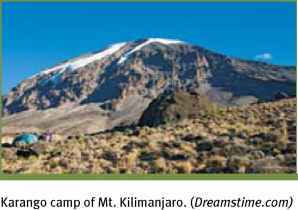 Mount Kilimanjaro glacier, immortalized in Ernest Hemingway's short story "The Snows of Kilimanjaro," has capped the equatorial African mountain for the past 11,700 years. But this glacier has been retreating for at least a century, perhaps due to a decrease in atmospheric moisture over that part of Africa. More recently, melting due to global warming has added to and speeded up the process. In all, the ice cap shrank from 4.71 square miles (12.1 sq. km) in 1912 to 0.68 square miles (1.76 sq. km) in 2006. Ohio State University's Lonnie Thompson has witnessed the acceleration of the rate of ice loss and predicts the end of the snows of Kilimanjaro at around 2015. At that time, all that remains of Kilimanjaro's glaciers will be in an Ohio State University freezer. Snowfall has increased in the interior of Greenland and portions of Antarctica, yet ice sheets in both locations are shrinking back. 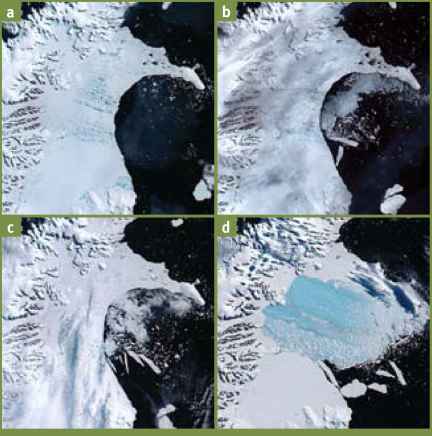 Warmer temperatures melt the ice sheets at their edges, while melt water traveling between the ice sheet and the underlying rock causes the ice to slip at its base and enter the melting zone more rapidly. 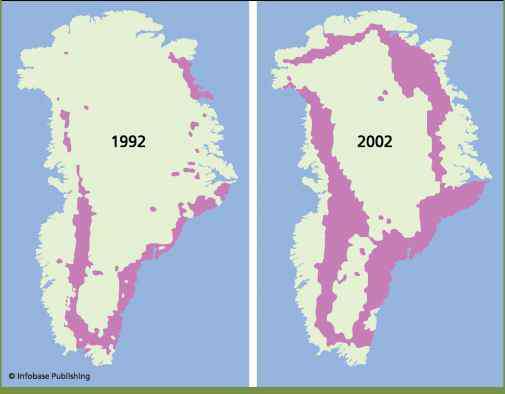 Between 2003 and 2005, Greenland's low coastal areas lost about three times more weight in ice than the interior accumulated as snow. The net annual ice melt is equal to the volume of water that flows through the Colorado River in 12 years. Ice melt on Greenland in 2002 was much more extensive than ice melt in 1992.
are covered all or a large portion of the year with fresh or salt water.) There is evidence that the southern extent of permafrost in the Yukon of Canada has moved poleward a distance of 60 miles (100 km) since 1899, although accurate records go back only 30 years. The loss of permafrost intensifies Arctic runoff and erosion because frozen lands are more stable. (Erosion is the transport of sediments from their original location by wind, precipitation, ice, or gravity.) Melting permafrost is a positive feedback mechanism for global warming because it releases methane and other hydrocarbon greenhouse gases into the atmosphere.